The "Lord of the East" ("Dong Jun") poem number 7 of the Nine Songs, illustrated version reprint from 1645. Jiu Ge, or Nine Songs, (Chinese: 九歌; pinyin: Jiǔ Gē; literally: "Nine Songs") is an ancient set of poems. 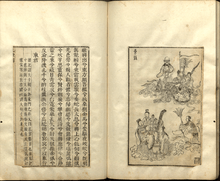 Together, these poems constitute one of the 17 sections of the poetry anthology which was published under the title of the Chuci (also known as the Songs of Chu or as the Songs of the South). Despite the "Nine", in the title, the number of these poetic pieces actually consists of eleven separate songs, or elegies. This set of verses seems to represent some shamanistic dramatic practices of the Yangzi River valley area involving the invocation of divine beings and seeking their blessings by means of a process of courtship. The poetry consists of lyrics written for performance as part of a religious drama, however the lack of stage directions or indications of who is supposed to be singing at any one time or whether some of the lines represent lines for a chorus makes an accurate reconstruction of how such a shamanic drama would actually have been performed quite uncertain; although, there are internal textual clues, for example indicating the use of spectacular costumes for the performers, and an extensive orchestra. In common with other Chuci works, the authorship of these 11 poems has been attributed to the poet Qu Yuan, who lived over two-thousand years ago. Sinologist David Hawkes finds evidence for this eclectic suite of eleven poems having been written by, "a poet (or poets) at the Chu court in Shou-chun (241-223) B.C." The "Jiu Ge" songs include eleven (despite the "Nine" in the title). Nine of the verses are addressed to deities, one to the spirits of fallen warriors who died fighting far from home, and the concluding verse. The reason for the discrepancy between the 9 verses referred to in the title and the fact that there are actually 11 is uncertain, although an important question, which has had several possible explanations put forth. Of these explanations, some may be rooted in general Chinese number magic or symbology. More specifically, David Hawkes points out that "nine songs" is referenced in the seminal Chu Ci work, Li Sao, referring to the nine (twice times nine?) dances of Qi of Xia. Critics and scholars have elaborated various hypotheses as to why the Jiu Ge ("Nine Songs") consists rather of eleven songs. An obvious, and common, suggestion has been that Number 1 and Number 11 songs are somehow to be classified as an introduction and a luan: examination of Song 1 and Song 11 fails to support this convenient conjecture, however. One suggestion, supported by sinologists Masaru Aoki and David Hawkes, is that for performance purposes there were nine songs/dances performed at each a spring and an autumn performance, with the spring performance featuring Songs 3 and 5, but not 4 or 6, and the autumnal performance 4 and 6, but not 3 or 5 (with the songs otherwise being performed in numerical order). Another explanation has to do with ancient ideas about numbers and numbering, where by the use of a numeric term, an order of magnitude, estimation, or other symbolic qualities are meant, rather than a specific quanty. 11 could be "about 9" songs. The following table shows the eleven individual poems of the Nine Songs. The English translations are following those of David Hawkes, although he uses Roman numerals for the traditional song order. Illustration of "Nine Songs", detail. Ink on paper, handscroll by Zhang Wo, 1361, Cleveland Museum of Art. From right-to-left (in the normal Classical Chinese direction of reading) showing poems 2, 3, 4, and 5. Of the 11 songs of the "Jiu Ge", 9 are addressed to deities and 1 to the spirits of dead heroes (the last verse section is a conclusional cauda). These deities include He Bo, also known as the River Earl or as the Count of the River, and the Lord (or God) of the Clouds. The deities of the Xiang waters, are the Xiangshuishen. Back in ancient China, people worshiped the God of Clouds (Yun Zhong Jun) hoping that there would be rain and nice weather for crops. This poem can be divided into two parts: one part is sung by the person who does the offering and the other part is sung by the person who acts as the God of Clouds in the form of antiphonal singing in order to show their admiration towards God of Clouds. The God of Clouds is sometimes seen as male and sometimes seen as female, but in Chinese literature, the God of Clouds is usually portrayed as female. This poem expresses the characteristics of the God of Clouds, the deep desire that human have towards God, and how God responds to people’s prayer through the antiphonal singing of human and God. This is such a deep emotion that it cannot even be fully conveyed through this poem. He Bo has been the deity of the Yellow River, one of the worlds major rivers, and one with close association with Chinese Culture. As such, He Bo has been associated with control of that wild river's occasional devastating floods and general qualities as an agricultural aquifer. The first translation of the Nine Songs into a European language was done by the Viennese scholar August Pfizmaier (1808-1887). Over 100 years later Arthur Waley (1889-1966) accredited it as "an extremely good piece of work, if one considers the time when it was made and the meagreness of the material to which Pfizmaier had access." ↑ Waley, 15: August Pfizmaier: Das Li-sao und die Neun Gesdnge. In Denkschriften der Phil. Hist. Classe der Kaiserl. Akad. d. Wissen- schaften, Vienna, 1852. Waley, Arthur, tr. 1955. The Nine Songs. Allen and Unwin.